Welcome to the 2017 MSPmentor 501. After months of research, data collection and analysis, MSPmentor is proud to present the 2017 MSPmentor 501 Global Edition – Worldwide Company Rankings. We’re proud to acknowledge this is the 10th anniversary of the industry’s most respected list of top managed services providers (MSPs). As usual, the latest MSP 501 ranking features IT services firms large and small, from virtually every corner of the earth. This is the second year utilizing a new approach designed to raise the bar in terms of quality, transparency and relevance. Take transparency: Prior to 2016, MSP 501 list was a bit of a mystery to companies that applied for inclusion. For the second consecutive year, MSPmentor is revealing the methodology used to rank individual companies. We’ve examined the business models, technologies, vertical markets and customer segments that MSP companies engage most. In the coming weeks and months, the editors at MSPmentor will follow up with additional features, news stories, profiles and more that flesh out our findings, which number far too many to fully examine herein. Also, keep an eye out for a downloadable PDF version of the survey results. Ask us about premium, Next Level reports with the most complete data and granular insights from the 2017 MSPmentor 501 survey. Taken as a whole, the companies on the 2017 MSP 501 list amassed a combined $14.48 billion in total revenue (based on 2016 results), up more than 15 percent from a year earlier. Of that figure, $4.30 billion was recurring revenue, an increase of nearly 13 percent from $3.81 billion in 2015. Despite the year-over-year increase, recurring revenues as a percentage of total revenue actually fell, ever so slightly – from 30.27 percent in 2016, to 29.67 percent last year. Following the trend of climbing revenue, headcount also grew at a healthy clip. Companies in the 2017 MSP 501 reported 41,915 full-time employees (FTEs) on Dec. 31 of last year, up nearly 12 percent from 37,487 at the end of 2015. On average, MSPs on the list earned about $190,000 per employee, though that varied widely among companies, with some earning as much as $1.43 million per FTE, and others as little as $8,750. Today’s release of the MSP 501 list is just the beginning. 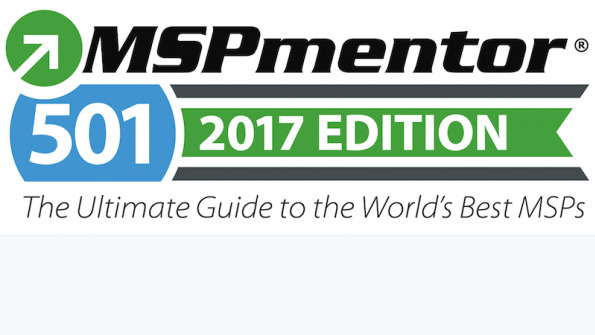 On June 28, we’ll release the MSPmentor 100 Small Business Edition, which honors the Top 100 MSPs with 15 or fewer employees. Two weeks later, on July 12, we’ll release rankings of top MSPs in North America; EMEA (Europe, Middle East and Africa); and AANZ (Asia, Australia and New Zealand). Later this summer and fall, look for additional lists from U.S. states and other geographic regions around the world. Click here for the full 2017 MSPmentor 501 Global Edition – Worldwide Company Rankings. Burhani Managed IT Services is excited to be the only MSP in the entire Middle East on the MSPmentor501 Global List! The list was released June 13. Please click on the relevant links in the story above. when will we be getting the certificate and the logos to use?? Hi, my boss has assigned me to inquire about pricing for the 501 list. If you could please get back to me with this information that would be greatly appreciated. Hi, please reach out to MSPmentorNews@Penton.com and we’ll get you to the right place. Do you expect the Small Business Ed to be released soon? I noticed the date being yesterday in the article but cannot find a link to this list. How many MSPs were reviewed in total to come up with the Top 501 out of ___? We’ve opted to not release that information. I have the same question as Tom. How many applicants were there for the 501 list in 2017? Are we the top 501 out of 502 companies or out of 5,000 companies? Thanks.